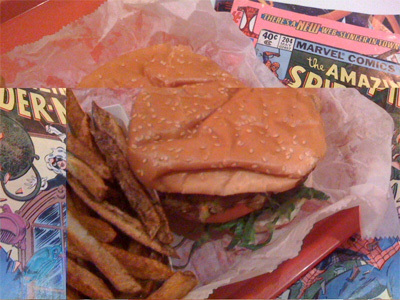 It's funny that my photo of his place got screwed up because that sort of mirrors my experience at Comic Burger. As a long time fanboy looking for an excuse to blow my diet for just one evening I was rooting for this place before I walked into it. Being a vegetarian I always have a fear walking into any burger joint that they'll screw up my order and swap the veggie burger with dead cow. And as if Lex Luthor was the chef my fears came true! I was ready to walk out but I figured that I had to give them another chance (well that and having spent $11 for my meal) so I sent it back. A few minutes later my order returned corrected, but once again the chef messed up: for some odd reason the chef put the toppings on the bottom of the burger. So I swallowed my pride and went ahead with the meal. The veggie burger wasn't bad, but the fries were too greasy and my Pepsi (did I mention I went there to cheat on my diet?) was barely cold. The decor wasn't half bad though and they had Batman playing on a huge monitor — and they did have some nice touches like having comic books at each table and an impressive Star wars display somewhat hidden where you order. The staff was kind, but what was funny was that they were more the otaku type of staff that you'd see in a comic book shop rather than a restaurant which was kind of charming. But at the end of the day that didn't make up for the meal itself. The telling thing is that I don't mind breaking my diet if the food was great, but I was left with the depressed feeling after that I regretted my choice (i.e. I should have gotten pizza, etc.). As if to confirm my thinking I asked for a copy of their menu before leaving and was told "oh we ran out!" Then I inquired if they even had a website to point to and was told "oh we're working on that!" I sort of assumed that his was just my experience but then I read several similar reviews on Yelp! when I got back to my place. This page contains a single entry from the blog posted on April 18, 2009 9:56 PM. The previous post in this blog was What type of jerk steals somebody's dog?. The next post in this blog is The Perfect Band Name for a Recession: Thinning of the Heard.